There is nothing like starting your morning (or ending your day!) 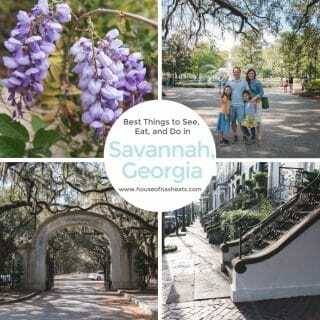 with a big slice of delicious, strawberry rhubarb coffee cake. 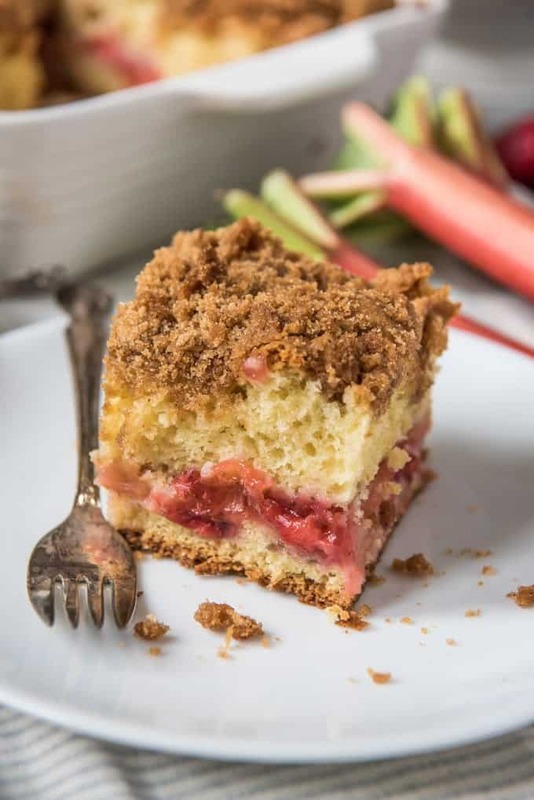 With a layer of bright, sweet tart fruit filling baked into a rich, moist cake made with sour cream and finished off with a thick, heavenly layer of buttery brown sugar cinnamon crumb on top, this easy cake is just as happy on the brunch menu as it is on the dessert table. 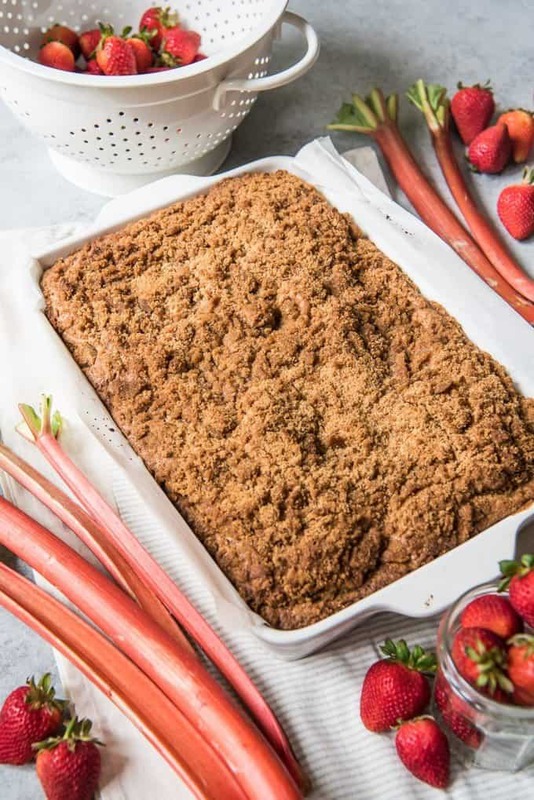 Since today is National Coffee Cake Day and I haven’t yet shared a coffee cake recipe on this blog, I decided to bake a delicious strawberry rhubarb coffee cake to celebrate! It may be a slim excuse, but really, no excuse is needed for something as easy and delicious as coffee cake! 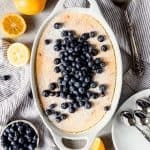 Although if you are looking for one, you’ve also got Mother’s Day, wedding and baby showers, graduations, and a host of other Springtime occurrences that can serve as reason enough to whip up a batch of this warm and satisfying cake. I have a deep and abiding love for strawberry rhubarb desserts. 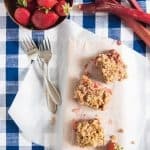 I have already shared some of my favorite strawberry rhubarb recipes with this strawberry rhubarb pie that is easily one of my top five favorite pies of all time, and these strawberry rhubarb crumb bars that are incredibly tasty as well. So it just made sense to me to use a strawberry rhubarb combination as a filling for a springtime coffee cake. 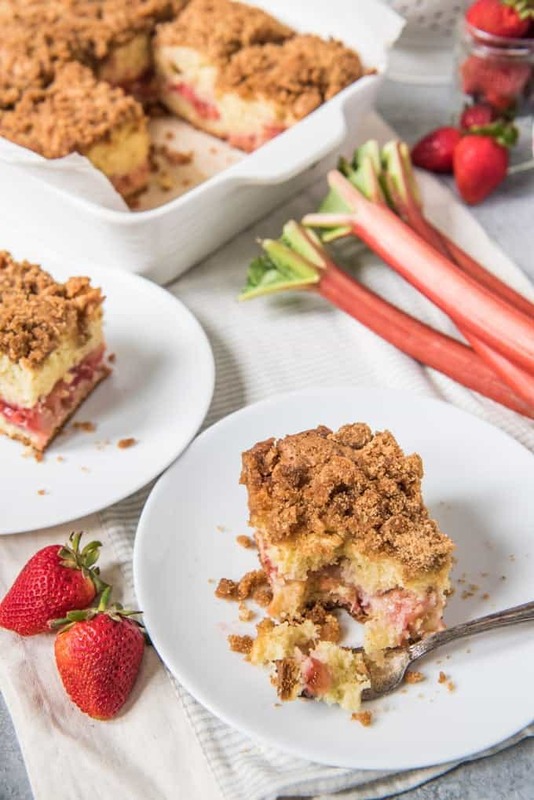 Especially since the warmth of the cinnamon and brown sugar topping balances out the tart and tangy strawberry rhubarb layer in between the temptingly tasty cake. If you think of yourself as a cinnamon crumb coffee cake purist, I have a pretty strong suspicion that this fruity variation could change your mind. Prepare the strawberry rhubarb filling. This isn’t a complicated process. 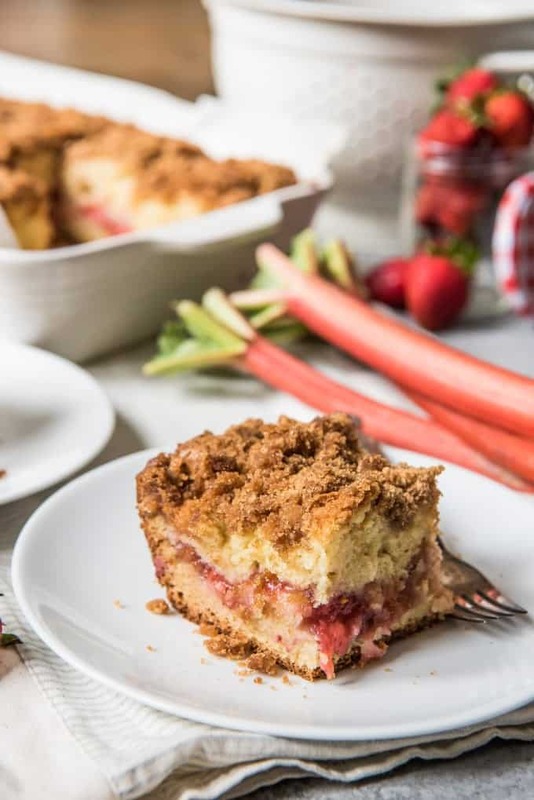 Just dump chopped rhubarb and strawberries in a pan with sugar, cornstarch, and a little water over medium heat and five minutes later your kitchen will smell divine and you will have a yummy jam-like filling ready to create a vibrant pink layer in this coffee cake. Mix together the brown sugar cinnamon crumb topping. Go ahead a use a pastry cutter, mixer, forks, or just your hands to blend the butter into plenty of brown sugar and cinnamon with a little flour, then squeeze handfuls to create clumps of streusel topping to sprinkle over the cake before baking. Cream the butter and sugar together, then add the eggs and vanilla. I find that starting with cold butter and adding the sugar slowly gives a really wonderful texture to the coffee cake. Same goes with adding the eggs, one at a time. Mix in the flour and sour cream, alternating between each addition. This is another tried and true technique with many cakes, to add wet and dry ingredients alternately. Just take care not to over mix the batter. Layer the coffee cake components in a large baking dish. You definitely need a 9×13-inch baking dish for this coffee cake so it has room to rise. 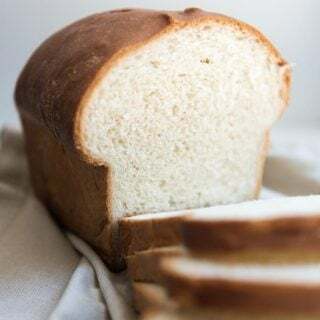 Bake for 50-60 minutes at 350 degrees F. The crumb topping will be a deep golden brown and a toothpick inserted into the center of the cake should come out clean, but take care not to overbake. Mine was done right around 55 minutes. Let your strawberry rhubarb coffee cake cool for at least 30 minutes. The layer of fruit filling takes longer to cool down and set up than other cakes so if you slice right into this, you will end up with strawberry rhubarb jam oozing out. If you want to show off that pretty pink ribbon of fruity filling in your slice, let the cake cool a bit before digging in. Pro tip: a still warm slice of strawberry rhubarb coffee cake and a scoop of creamy vanilla ice cream are a match made in heaven. Love coffee cake? 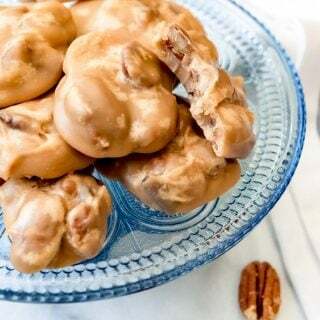 Here are even more coffee cake recipes from some of my food blogging friends for you to celebrate National Coffee Cake Day! Heat oven to 350 degrees F. Line a 9x13-inch baking dish with parchment paper, then butter the paper and set aside. 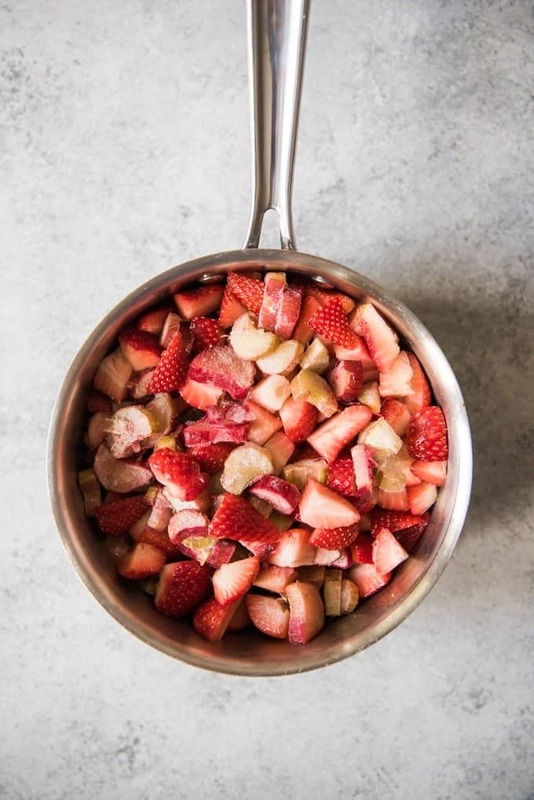 In a medium-size saucepan over medium heat, combine the rhubarb, strawberries, sugar, cornstarch, and water. Stir frequently until the cornstarch begins to thicken but the rhubarb is still fairly firm, about 5 minutes. Remove from heat and set aside. In a large bowl, combine the brown sugar, flour, and cinnamon. Using a pastry cutter, cut the butter into the sugar and flour mixture until it resembles coarse sand. Use your hands to squeeze handfuls of topping together, creating some larger clumps, then set aside. 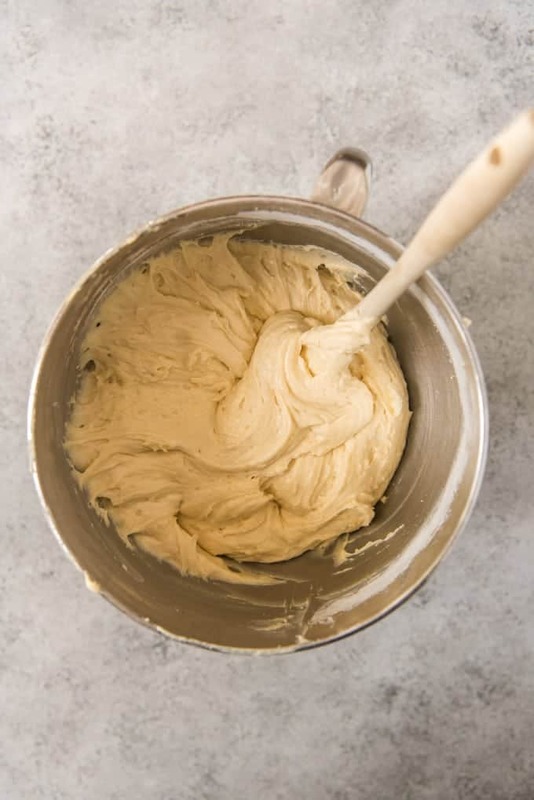 In the bowl of a stand mixer, beat the cold butter until smooth and creamy. Slowly add the sugar while continuing to beat at medium speed, until light and fluffy. Add the eggs, one at a time, scraping the bowl and beating well between each addition. Mix in the vanilla. 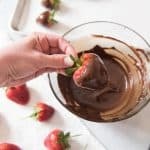 In a separate bowl, whisk together the baking soda, baking powder, salt, and flour, then add the flour mixture to the batter 1 cup at a time, alternating with 1/2 of the sour cream between each addition and mixing on low speed just until everything is combined. Be careful not to over mix. Spread half of the cake batter into the bottom of the prepared pan, using a spatula to make an even layer right to the edges of the pan. Top with the strawberry rhubarb filling, gently spreading that to the edges as well. Dollop the remaining cake batter over top of the fruit filling, using a knife or spatula to gently spread it to the edges as well. Evenly sprinkle the crumb topping over the cake batter, squeezing handfuls of topping again to make sure there are at least some larger chunks of topping. Transfer the coffee cake to the oven and bake for 50 to 60 minutes, until a cake tester inserted into the center of the cake comes out clean. Cool completely. Recipe adapted from Serena Bakes Simply From Scratch. As you know, I was going to make a rhubarb strawberry coffee cake too but then life got in the way. 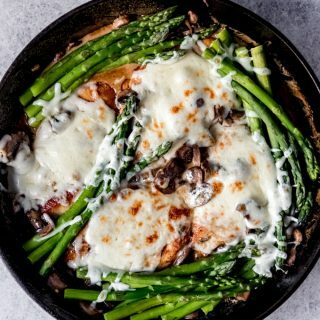 This recipe sounds better than that which I was going to use so it all worked out in the end and this is going on my to make list. That rhubarb can be tricky to find this early in the season! I called around and got lucky to find some at a local store, so I bought a bunch and chopped the rest to freeze for when it’s out of season again! 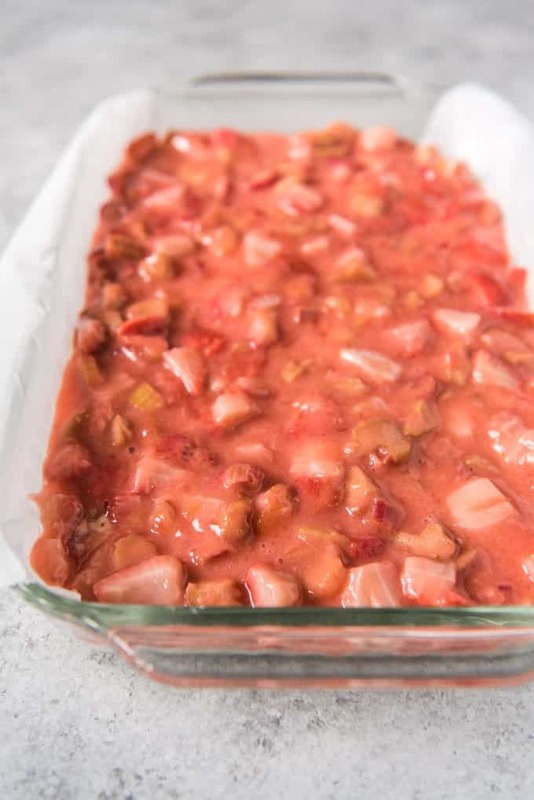 I love strawberry and rhubarb together, and that topping is calling to me! Looking forward to the farms opening up with rhubarb in a month or so! One of my favorite spring combos! Glad you found some rhubarb to make this cake! I really need to seize the moment when rhubarb is in season here. This sounds delicious, and that topping!!! Gorgeous! This is gorgeous and sounds incredibly yummy. 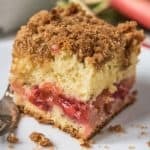 I love rhubarb and strawberry together but never had it in a coffee cake and that probably needs to change. YUM! 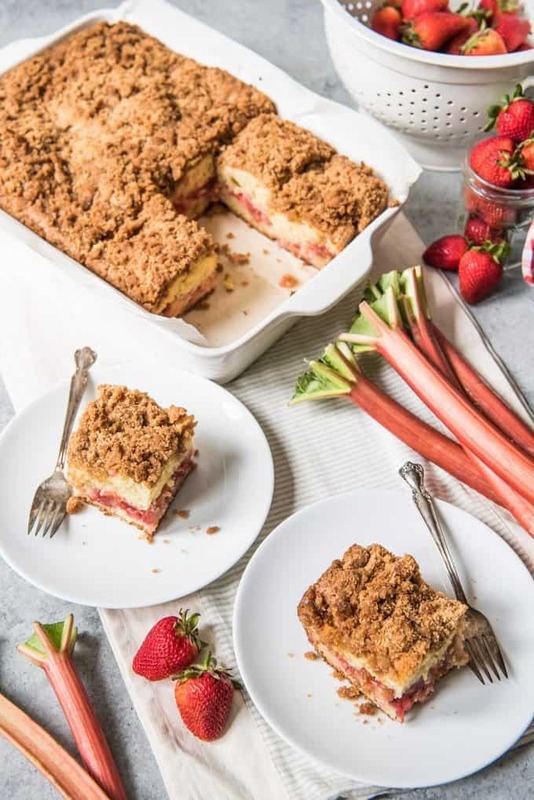 Nothing says spring like strawberries and rhubarb and this sounds amazing! Such a classic flavor combination in a delicious coffee cake package. 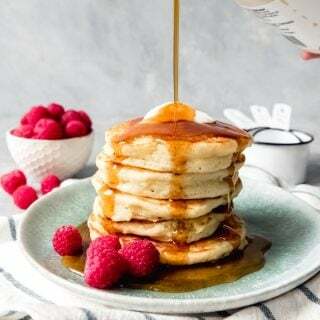 That cinnamon topping looks divine! Mmmm….this strawberry rhubarb coffee cake was so delicious! 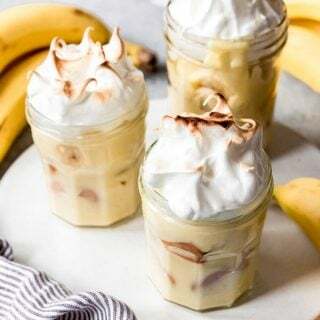 I’m so happy I stumbled upon this fabulous recipe. I’ll be making it again for Mother’s Day. Thanks so much for sharing it! 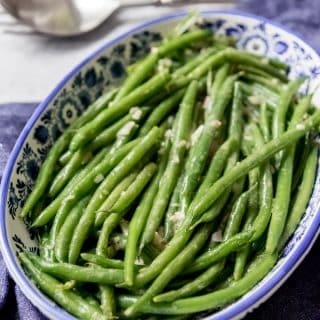 Loving these spring ingredients right now! This coffee cake look absolutely amazing! I would love a piece! Rhubarb cake is my favourite rhubarb recipe ever and famous among my friends. Believe it, this is a fabulous cake! 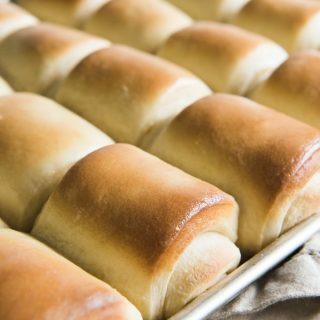 Once you eat it, you will ask for more.